The withdrawal of the United States (US) from the Trans-Pacific Partnership (TPP) and Trump’s “America First” agenda have ignited a second round of interest in mega-free trade agreements (mega-FTAs) in the Asia Pacific region. Countries have been motivated to explore alternative trade policy options. 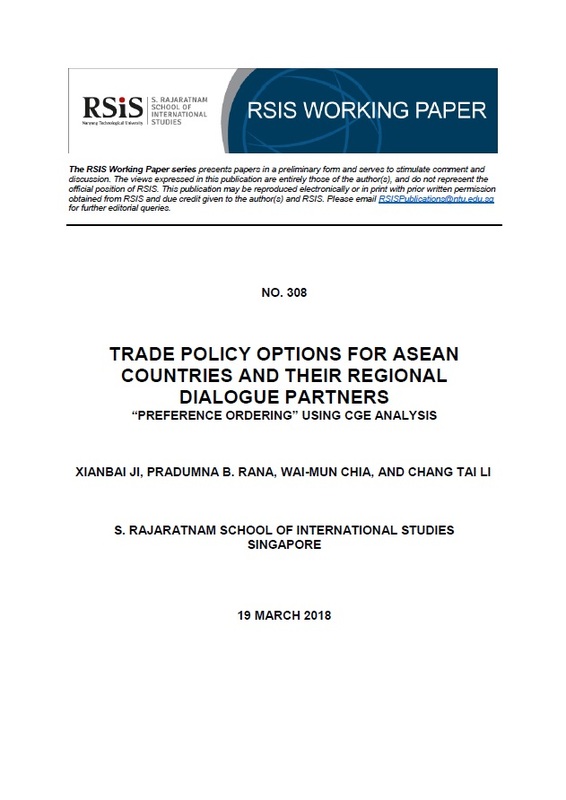 Using national real gross domestic output (GDP) gains estimated by the GTAP model to construct “preference ordering” for ten Association of Southeast Asian Nations (ASEAN) and their six regional dialogue partners, this paper comes up with several findings. First, when multilateral agreements are not possible, countries are better off with a narrower regional trading agreement than without one. Second, in the region, RCEP has higher beneficial impacts than the CPTPP. Third, for dual track countries, that is countries that are negotiating both the CPTPP and the RCEP, implementing both agreements is better than each separately. Fourth, as expected, economic impacts of the CPPTP are lower than those of the original TPP12, but all CPPTP members will benefit although to different degrees. Fifth, economic impacts of open regionalism are higher than those of a closed and reciprocal one. Going forward, the paper argues that ASEAN countries and their regional dialogue partners need to adopt a “multi-track, multi-stage” approach to trade policy.